We offer the precision engineered range of Heavy Duty Lathe Machines. 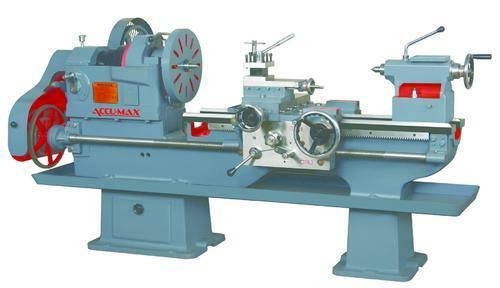 These heavy-duty lathes are manufactured from highest grades of material like iron and steel and are available in customized specifications for our client's benefit. We are one of the recognized firms engaged in Manufacturing, Trading and Exporting an exclusive range of precision Lathe Machines, Surface Grinder Machines, C Type Mechanical Power Press, Milling Machines, Slotting Machines etc, that serves various industrial applications across the globe such as the automobile, electronic, electrical to name a few. In our range we offer heavy duty lathe machine, medium duty lathe machine, surface grinder, metal cutting band saw, slotting machine to name a few. These are manufactured from quality grades of material like iron and steel and ensure high quality and durability. Our products have flawless quality products and an enviable clientele is the result of the unparalleled infrastructure and workforce to help us in offering the most efficient and durable machines in the international market. To maintain high-quality standards and dimensional accuracy of our machines, we have a specialized quality assurance and R&D team with us.